Raising chickens on your estate or even in your backyard is a very fulfilling activity that requires dedicated time and practice. No matter how large of an operation you’re running, there are many important tips on raising poultry that every beginner must be aware of. Once everything is up and running smoothly, you may be surprised how little maintenance is necessary, but this, of course, is the product of proper planning and preparation. Begin by choosing a coop location on your property. Chickens do not need copious space to thrive, but it’s best to reserve at least a 6 ft x 6ft plot for 2-3 chicks. The coop preferably should be in open space, away from wetlands or portions of your property that are susceptible to flooding or standing water. The general rule of thumb is that a larger space is better for the general health and longevity of the chick, but space can definitely be economized if this is an issue. Your greatest monetary investment, however, will likely be erecting a proper fence to protect your chickens from hungry wild animals. Chickens are extremely vulnerable creatures, so make sure that a proper enclosure is erected surrounding the coop. Materials for erecting a chicken coop perimeter can be purchased rather easily at your local hardware store. Once you’ve isolated some space for your flock, the exciting part begins – choosing the actual chickens. There are many, many different breeds and mixing and matching them is encouraged. 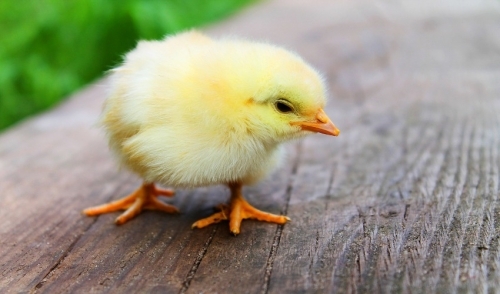 An ideal beginner’s flock size is 3-5 chicks of different breeds. It’s best to begin with grown chickens as opposed to newborn chicks, which will require a considerably greater amount of time and resources, such as brooding and direct feeding. Keep in mind that chickens inherently social animals that require near-constant social engagement. The more, the merrier is the general rule of thumb, and 3-5 grown chickens to start is a manageable recommendation. Lastly, ensure that your chickens are safe from a curious cat or dog within the household. Beginner poultry raisers will often invest a substantial amount of time and money in protection from wildlife, when household pets are more of an immediate danger. Daily chores and maintenance are surprisingly minimal once the operation is up and running. Experts recommend cleaning out the coop every 1-3 months depending on its parameters, and of course, the number of chickens it houses. Food and fresh water should be provided on a daily basis, in addition to a new layer of litter each week. Matured chickens will begin laying eggs around 6-months, so keep a keen eye out for some delicious home-raised eggs around this point. Even if you’re not looking to capitalize on the scrumptious products of owning a flock, raising your own chickens is an undoubtedly fulfilling activity. Whether it be 3 or 13 chickens you wish to raise, you’ll be surprised at the minimal upkeep necessary to raise a healthy flock.